These two novels from the 1970s had been on my wishlist for a while, since I first developed an interest in reading about the Wars of the Roses, and I’m pleased to have finally had an opportunity to read them. Some Touch of Pity, in particular, is an excellent book; although, chronologically, it is set after Fortune’s Wheel, it was published first (in 1976) and is the first one I’m going to write about here. 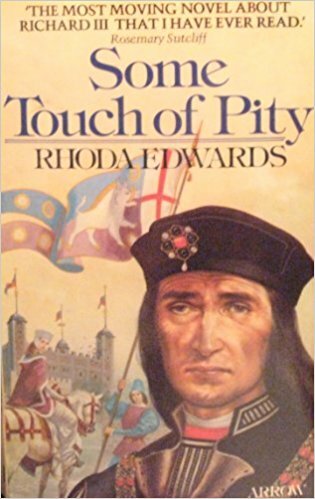 Some Touch of Pity (US title is The Broken Sword) covers a relatively short period of history, beginning in 1483 just before the death of King Edward IV and ending with Richard III’s defeat by Henry Tudor at the Battle of Bosworth in 1485. In between, all the major events of Richard III’s ill-fated reign are covered – if you know the period you won’t need a summary from me and if you don’t then I won’t spoil the story for you other than to say that it was a time marked by rebellion, betrayal, rumour and several tragic deaths. The book is divided into several sections, each one written from the perspective of a different narrator and offering different insights into Richard as a man or as a king. There are even one or chapters narrated by Richard himself – interestingly, of all the novels I’ve read about Richard III, I think this is the first one that allows us to hear his story, even a small part of it, from his own point of view. Other narrators include Richard’s close friend Francis Lovell, his niece Elizabeth of York and court physician William Hobbes, but my favourite is Anne Neville, Richard’s beloved wife and queen. I found Anne’s sections of the book particularly moving and poignant, painting an intimate picture of Richard as a husband and father, whereas some of the others are more concerned with how he deals with the political and military challenges he faces as king. The novel is perfectly paced, spending just the right amount of time with each narrator before moving on to the next. As it heads towards its inevitable conclusion there’s a sense of dread, but even knowing what’s ultimately going to happen, it’s difficult not to find yourself hoping that this time there will be a different outcome. The section describing the Battle of Bosworth is powerfully written, brilliantly showing Richard’s state of mind before and during the battle as well as the crucial role of Lord Stanley and his brother in deciding the result. However, I wished the book had ended here as the final chapter, giving an account of the aftermath of the battle and the abuse inflicted on Richard’s body was so harrowing and graphic I could hardly bear to read it! The only thing left to mention is the mystery of the Princes in the Tower. Rhoda Edwards gives a plausible explanation for their disappearance (although it’s not one I’ve ever found very convincing), but as we don’t actually see the princes after they enter the Tower, we have to rely on the word of several of the other characters – and who knows whether they’re telling the truth. It’s all quite ambiguous! Fortune’s Wheel was published two years later, in 1978, but is actually a prequel to Some Touch of Pity. It covers an earlier period in Richard’s life, starting in 1468 when, as the young Duke of Gloucester, Richard is caught up in the conflict between his elder brother, Edward IV, and the Earl of Warwick, the man known as the Kingmaker. The novel takes us through Warwick’s rebellion, the betrayal of George, Duke of Clarence, and ends in 1472 with Richard’s marriage to Anne Neville. The style of this novel is different from the previous one; rather than being a collection of first person accounts, it is a straightforward third person narrative. This means that Fortune’s Wheel lacks the intimacy of Some Touch of Pity but at the same time it does have a broader scope – this is not just the story of Richard, but also of Edward, George, Warwick, Anne and many other characters. It’s not a very long novel but still manages to give a fair and balanced view of this period of history, bringing each character to life as a real human being with a mixture of good points and bad points. Although Some Touch of Pity is my favourite of the two books, I enjoyed them both. They could be a good choice for readers new to the period, but in that case I would recommend reading them in chronological rather than publication order to make the timeline easier to follow. 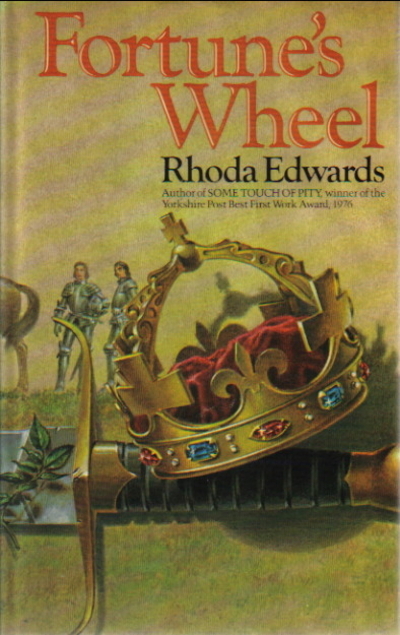 Rhoda Edwards also wrote a book on Elizabeth I, None But Elizabeth, which is now on my TBR! This is a new writer for me, but I am always interested in the Wars of the Roses. Yes, me too – it’s one of my favourite periods to read about. I would love to read both. They are both good books, if you’re interested in the time period. These sound like a good coverage of the period. These are two of my very favorite novels about Richard! Although shorter, the writing and storytelling are very strong. Highly recommended! Yes, I thought these were very well written books. I enjoyed them both and am glad you did too.